Archival photo from the New York Times, 1936. 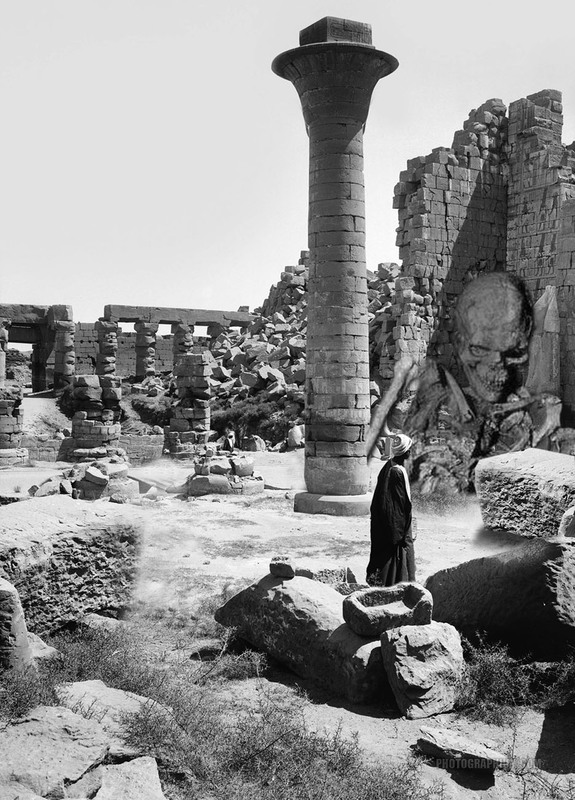 Note the giant skeleton nestled against the ruined wall. Recent research led to a goldmine. A friend of mine who works in the archival department of the New York Times was looking for some information for an article on the history of archaeology in Egypt, when he came across the above image and the scanned article at right. The article dates to 1936 but does not mention the name of the staff writer. My friend prefers to remain anonymous (I’ll call him “Jonas”) because these items were in an old folder marked CONFIDENTIAL, and he doesn’t wish to get into trouble. A memo paper-clipped to the folder, Jonas explained in the email to which these items were attached, had words to the effect that this was deemed to be of a highly sensitive nature and was never meant for public consumption. It’s possible whatever archaeological team was conducting the dig when the giant skeleton was unearthed, felt it better to keep everything secret. Probably the academic institution to which this team was attached was the impetus for the secrecy—academia does not like to upset its applecart. The article mentions a photographer named Henry Leichter who was working at the time for the University of Chicago (Oriental Institute), but neither Jonas nor I have been able to determine if it is this university which wished to bury the shocking discovery of 1936. But due to my friend’s plucky spirit, it need be buried no more. He and I have brought the truth to light. I’m glad Jonas remembered my love of all things ancient Egyptian, and that I write this blog, so here we have found a way to publish what had been hidden from the public eye. What’s more, everything in the above paragraphs is a steaming load of bullcrap. I made it up. All of it. I Photoshopped the photograph, as well as typed the “article” and used Photoshop to give it an aged look. It was quite fun. Oh, and I don’t have a friend who works for the New York Times. I don’t think I even know anyone who works for the New York Times. You readers who are familiar with my blog either knew straight away that I was pulling your leg or must have quickly begun to wonder if I had fallen off the edge of sanity. But the above photo as well as the fake article are of the type you see all over the internet, on half-baked web pages professing to offer “proof” that the ancient world was populated by giant humans. 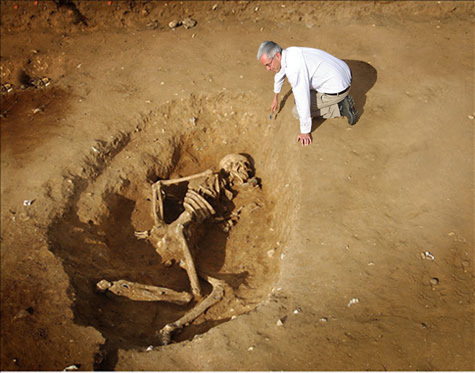 After all, giants are mentioned several times in the Old Testament (see Genesis 6:4 as an example). The Bible wouldn’t mislead us, would it? The original word in ancient Hebrew is Nephilim, which is most likely a loan word from the Aramaic naphil, which does in fact mean “giant” (see Heiser, sitchiniswrong.com). So it must be true, then, right? Perhaps not. The day ancient religious texts are the sole means by which we analyze and study ancient civilizations, is the day on which we must concede that we’ve abandoned the greater amount of our common sense. I am not demeaning the Bible, mind you. It is rightfully the greatest book ever written, but it’s not a history book. Some of these fake images are very well done, and I must admit many of them are better than the one I slapped together at the top of this article. This one here is quite realistic, except for the fact that the shadow of the skeleton in its pit and the shadow of the squatting man are extending in opposite directions. Quite a few of the fake photos out there have obvious mistakes. But many do not, and they look quite convincing. That doesn’t make them authentic, of course. Anyone who has Photoshop, as well as most any sort of word-processing program to type out a “newspaper article” can put together real-looking images. Common sense alone is what should be the determining factor. Most of us will see such images and chuckle, but certain people out there will see such an image and think it’s rock-hard proof. That’s unfortunate. Ancient Egypt is a favorite for the folks who want to believe in giants roaming the world of millennia ago. Certain things about the great pharaonic culture make it simple for the hoaxers to use Egypt, as well as for the gullible to fall for it. This was an actual battle which took place in 1274 BCE, early in Ramesses’ reign. The Egyptians faced the Hittites at Kadesh, and although no clear winner was determined, Ramesses covered the walls of several temples with such battle scenes not only to make it seem as though the Egyptians had won but, of course, to show his own great prowess and courage. 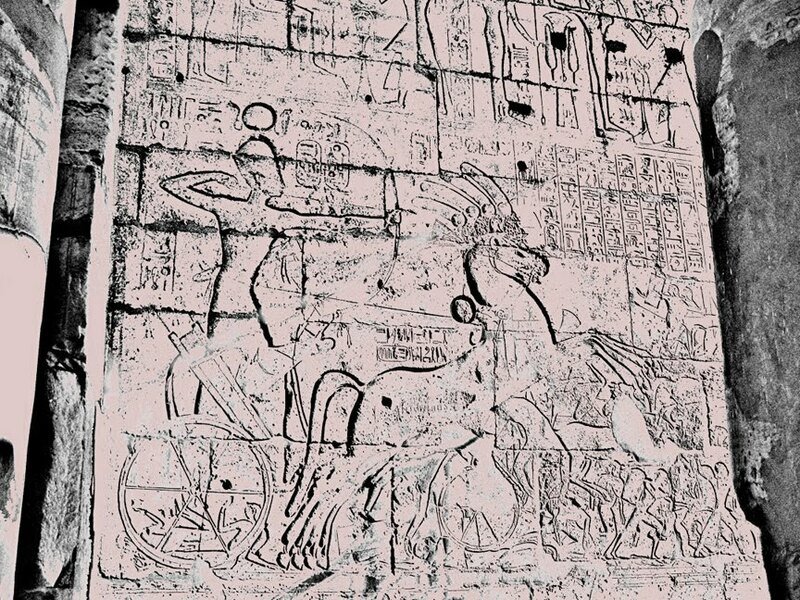 Look below the figures of the rearing horses pulling Ramesses’ chariot. You will notice itty-bitty Hittite soldiers. They’re fleeing in the face of the great Egyptian pharaoh, who is clearly a literal giant because he is shown in the scene as towering above them. It’s beautifully cut and inscribed. At right are seated a husband and wife in the act of receiving offerings. Chances are, both of them were deceased when this monument was made. But look to the left and you’ll see who’s presenting the offerings: tiny little servants. Clearly, then, it was not only the royals who were giants, but also many of the people in the ranks of the elite. Many of you may be aware of why the ancient Egyptians produced art this way, but even so, if some of you readers do not know why this was done, I’m willing to bet you’re not going to chalk it up to giants. It’s that common sense thing, again. For those who would like to know the explanation, it’s due to a principle modern art historians call hierarchical scaling. Whether the ancient Egyptians even had a word for it is not of importance, because it was simply part of their artistic traditions and practices from the very dawn of their kingdom at the end of the fourth millennium BCE. Basically, in any scene where more than one person was shown, the figure of most importance and greatest status in that scene was usually depicted as physically larger than the other people (Robins 2008: 21). The bigger the better, in other words. Kings are usually shown the largest in any given scene, of course, with the exception of deities appearing in the same scene; in such cases the king is often shown at the same scale as deities, but any other human figure usually will look diminutive. Where a male and female are shown together, often the male is shown larger, including depictions of kings and queens. This was not a universal practice, of course, as you can see in the stela of the husband and wife above. And on occasion kings and queens when shown together were sometimes of equal size, which is evident in the artwork of several pharaohs such as Amunhotep III and Queen Tiye, Akhenaten and Queen Nefertiti, and Ramesses II and Queen Nefertari. The scene comes from the tomb of Rekhmire, a powerful nobleman who served as a vizier under both Tuthmosis III and Amunhotep II, in Dynasty 18. He lived around 1420 BCE. His tomb (TT100) is in western Thebes, the most popular burial ground through most of the New Kingdom. TT100 is particularly famous for its rich depictions of all manner of workmen and craftsmen performing their labors, under the steady supervision of the great vizier himself. What we have here is a good example of people in the fringe camp seeing an image but not knowing how to interpret it, nor decipher what it meant to the ancient Egyptians. I rather doubt the ancients would care how someone living over 3,000 years later would understand such scenes, other than to be offended by extremes in misdirection. The Great Pyramid was built around 2500 BCE, in Dynasty 4. Again, Rekhmire was a nobleman of Dynasty 18, over a thousand years after the time of the Great Pyramid. By Rekhmire’s time, in fact, pyramids were no longer even part of royal burials. The religion of the state had changed considerably since the days of the Old Kingdom. As is the case with so many ancient tomb depictions, the figures in TT100 are accompanied by hieroglyphic captions which explain what they’re doing. In the case of the scene shown above, the caption for these workers states that they’re “Molding bricks to build a magazine anew [for the Temple] of Karnak” (Hodel-Hoenes 2000: 162). It’s notable that the Karnak temple is explicitly mentioned, which alone discounts any connection with the Great Pyramid or any other monument far to the north at Giza. A “magazine” is a modern term used to describe the ancient Egyptian word for storehouse. These ancient storehouses were often made from small mud bricks, which the men are shown making and carrying. The men themselves comprise a group of Syrian and Nubian prisoners of war (ibid); such men were often bought back to Egypt as labor-slaves. So, no, they’re not giants. 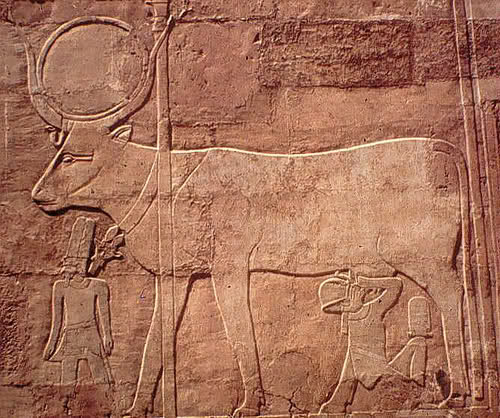 Here a pharaoh is shown drinking from the utters of an enormous cow—certain proof that giant animals once roamed the Nile Valley? No, probably not. Inscriptions are not evident in this scene and it’s not like I have all of them memorized, but based on the iconography of the cow (e.g., sun disk and diminutive king) I think I’m safe in identifying it as the common bovine manifestation of the goddess Hathor. As with other important deities Hathor had a very busy job description and performed a number of roles, and one of the most important was as the divine mother-figure to the king; she is the nurturing bovine (Wilkinson 2003: 141). Here, the king is as a child gaining nourishment from his mother’s breast. In other such depictions the king is shown standing in front of the divine bovine, whose head extends protectively over and beyond the king. 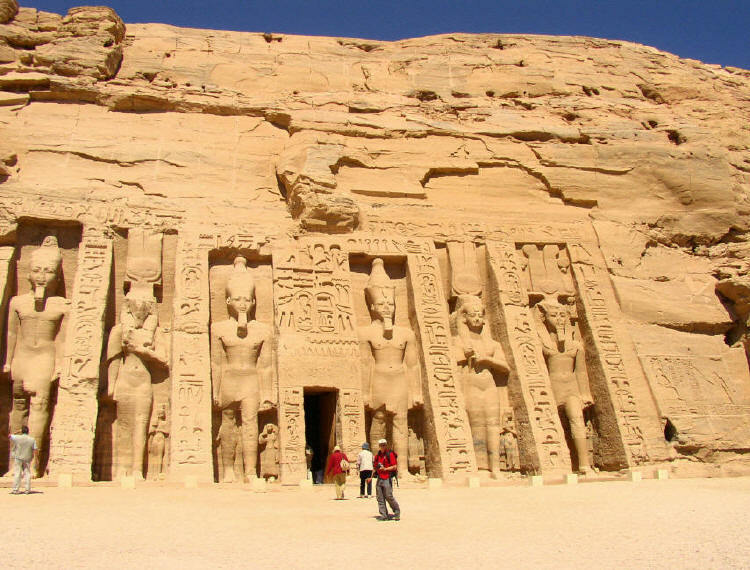 The colossal statues represent Ramesses II and Nefertari. They are indeed gigantic. 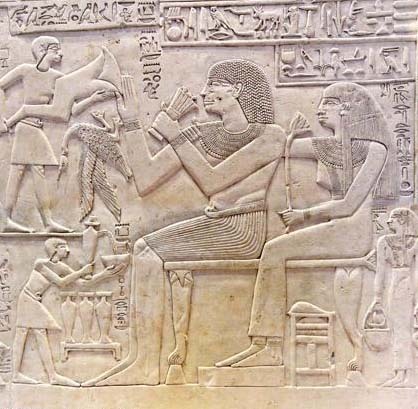 Look to the sides of their legs and you will see small statues of their children; included here are princes Meryatum, Meryre, Rahirwenemef and Amun-her-khepeshef; and princesses Meritamun and Henuttawy. It would seem, if Ramesses II and Nefertari were actually literal giants, they were giving birth to runts. No wonder the giants died out. What might the archaeological record show? After so many years of people excavating the land of Egypt, where are the remains of giant humans? We are obligated to dismiss cleverly Photoshopped internet images, so what we’re left with is rather disappointing to the pro-giants crowd. No giant skeleton has ever been found. Anywhere. Historians and scientists have been studying the human remains of ancient Egyptians for many years now, and what we learn is that the ancient Egyptians were of the same physical stature and size of pretty much everyone else in the ancient Mediterranean world. Men averaged 5’3″ and women 4’10” (Nunn 1996: 20). These were not gigantic people, of course. Tut’s is not the best-looking mummy on record, but in life this young man stood at about 5’6″, a good three inches taller than most adult men in the Bronze Age. Unknown Man E is rather infamous for his particularly ghoulish appearance. Early historians first thought he had been violently killed or mummified alive, but there is no evidence to prove either. 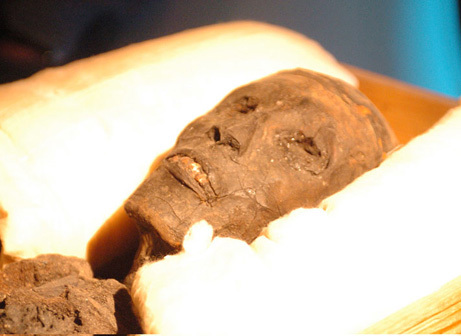 The prominent researcher Bob Brier has argued that this is the body of a prince of Dynasty 20 named Pentaweret, who was involved with the harem conspiracy of Ramesses III and was forced to commit suicide by ingesting poison. It is an attractive theory but not proven. Unknown Man E was not mummified but seems to have been naturally preserved inside the uninscribed coffin in which he’d been interred. Consensus is that he lived in the New Kingdom. 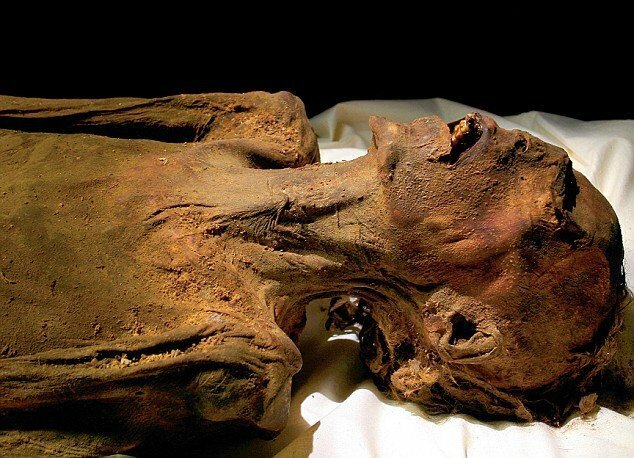 Unknown Man E is quite well preserved for someone who was not mummified, but that’s sometimes how it worked out when people were buried in the arid environment of the desert. Most unusual, however, is that in life this man was around 5’9″ tall. Quite a tall man, in other words. But not a giant. Considering this, I often think of David and Goliath. If there is any truth to this biblical tale, David was probably a man of ordinary height (around 5’3″) while Goliath could’ve been something like a towering 6’2″. Now, to the average man of the ancient Near East, that would’ve been a giant. We can think of modern people who’ve suffered from disorders like gigantism. Such people can grow to between seven and nine feet. These are indeed giants among us. But as is well understood, gigantism is a disorder caused by the over-production of growth hormones, and folks afflicted with it suffer from all manner of complications. Human beings are not meant to grow to such heights. The archaeological record is silent on the subject of a race of giants. Ancient man was, indeed, considerably shorter than the average modern man. Depictions of colossal figures must be understood in the context in which they were created in wall paintings and other monuments. Perhaps most important, no one should fall for cleverly devised Photoshopped images and fake newspaper articles. When we dig deeper and evaluate things from the right perspective, we find the real answers. This brings me to my concluding point, and I had some fun with it in the fake 1936 newspaper article I concocted at the top of the page. People of the pro-giants crowd well understand, I think, how silent real-world evidence is for giants, so they frequently turn to the one desperate measure left to them: they claim the world of academia is conspiring to hide “the truth” from all of us. I wrote about this in my recent article Tactics of the Fringe. Not only is such a claim desperate, it is quite divorced from reality. Such folks would have us believe that all archaeologists and Egyptologists and historians and other specialists who’ve been at work in Egypt for the past two centuries, have worked in concert to conceal ancient giant humans from us. All this reveals is the pro-giants crowd has no real understanding of the world of academia. If they possessed an understanding, they would know such a grand and all-encompassing conspiracy could not survive a few years, much less 200 of them. As always, I thank you for reading my article, and I welcome comments and questions. Hodel-Hoenes, Sigrid. Life and Death in Ancient Egypt. 2000. Nunn, John F. Ancient Egyptian Medicine. 1996. Robins, Gay. The Art of Ancient Egypt. 2008.